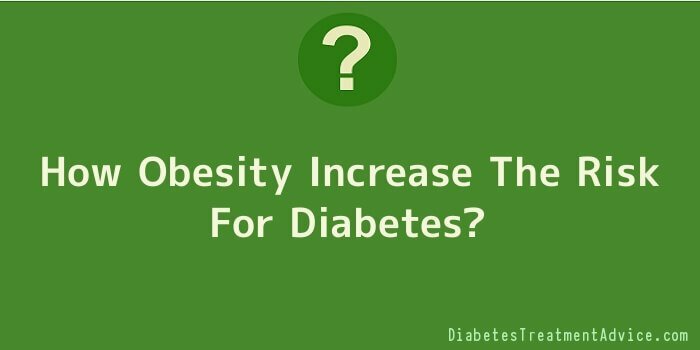 How Obesity Increase The Risk For Diabetes? Among all the people who are diagnosed with type 2 diabetes in the United States about 80 to 90 percent of them are also diagnosed as obese. Diabetes rates from the Centres for Disease Control and Prevention (CDC) National Health and Nutrition Examination Survey III shows that two-thirds of adult men and women in the country, who are diagnosed with type 2 diabetes, have a body mass index (BMI) of 27 or greater, which is classified as overweight and unhealthy. This fact suggests an interesting obesity and diabetes correlation. Understanding what causes the disease will optimistically prevent people from having overweight diabetes in the long run. Obesity is defined as a condition of being overweight due to the unhealthy and irregular eating habits. It is having an excessive amount of body fat that results in the excess body weight. It has become a major health issue that leads to health risks, including heart attacks, heart disease, high blood pressure, and diabetes. A healthy person’s weight must be proportional with his or her height. The ideal body mass index (or BMI) is within the range of 18.5 to 24.9. In clinical terms, a BMI of 30 and above suggests obesity. Obesity offers negative effects on the general health, lifestyle, and well-being of an individual. Overweight people who become very inactive have greater risks on acquiring different kinds of illnesses, such as cardiovascular, cancer, diabetes, and many more. Diabetes is a condition in which the body is unable to regulate levels of glucose in the blood. This results in too much glucose being present in the blood. Tissues weaken as glucose-starved cells are forced to consume their own proteins. Eventually, diabetes can lead to serious complications, such as damaged blood vessels and nerve cells, which lead to kidney failure, blindness, heart attack, stroke, impotence, foot problems, and amputation in adults, unless measures are taken. There are two kinds of diabetes—type 1 and type 2 diabetes, which both hinge upon the effects of insulin. Insulin is defined as a hormone that causes the body’s tissues to absorb sugar from the blood and prevents sugar levels in the blood from getting too high. Type 1 diabetes, also known as Childhood Onset Diabetes, generally begins early in life. It is the result of the immune system destroying cells in the pancreas which cause diabetes. This type has no relation with obesity. On the other hand, type 2 diabetes, also known as Adult Onset Diabetes, is manifested by the gradual development of insulin resistance. Because the body’s tissue does not respond as strongly to insulin, it prevents them from absorbing the sugar level that they normally need, which, in turn, results to increased blood sugar levels. This kind of diabetes can result from obesity. In all forms of diabetes, the increase in water loss results to the increase in weight loss. And if this method of weight loss is hard for the body, it can cause dehydration and other damages, if left untreated. Most of the increase in the previous year’s constitutes 85 percent of diabetics who suffer from type 2 or Adult Onset Diabetes. These people lack the ability to use the hormone insulin. Diabetes can be indicated by a number of symptoms; however, these symptoms may not appear or be noticeable until glucose levels become extremely high. As a result, most people who have diabetes are not even aware that they have it. If you are still wondering on how does obesity cause diabetes, many recent studies have shown a direct link between obesity and diabetes type 2. Also known as Adult Onset Diabetes, type 2 is a serious disease causing complications that can increase a person’s chances for premature death. It is usually being diagnosed in overweight children and adolescents. The body of a type 2 diabetic can no longer produce the required amount to maintain healthy blood sugar levels. It begins to develop resistance to insulin. 90 percent diabetics are diagnosed with type 2 diabetes. Usually diagnosed in people age 40 years and above, it is now increasingly found in children. Today, diabetes and obesity statistics show that almost 25 percent of American children are obese and this increase in the percentage of obese people has been directly linked to the rise in type 2 diabetics, both children and adults. Approximately, 70 percent of diabetes risk in the US can be attributed to excess weight. It is now of no question why does obesity cause diabetes. Children who are overweight have greater risks of suffering from diabetes. If type 2 diabetes was rare in American children before, 8 to 45 percent of newly diagnosed diabetes cases in children and adolescents have been continuously reported today. There are a lot of ways to lower your chances of being obese and getting diabetes. Some of the ways include exercising regularly, reducing fat and calorie intake, and losing weight. Studies have shown that these lifestyle modifications are even more effective in people age 60 years and older, with a reduced diabetes risk by 71 percent. With the threat posed by obesity and diabetes in the United States, it is a growing challenge for the all the governments, individuals, and industries to stop these numbers from increasing. And this will only be possible if acceptable strategies will be implemented. The link between obesity and diabetes has long been a topic of debate and everyone is hopeful to resolve these two life-threatening health issues.